Qashqai rugs are woven using large amounts of very bold shades of red. Providing a perfect complement to the prominent red are classic yellow and indigo blue. Qashqai rugs usually have different shapes and patterns, for example animal and bird drawings used both as part of the repeat patterns and as filler ornaments. 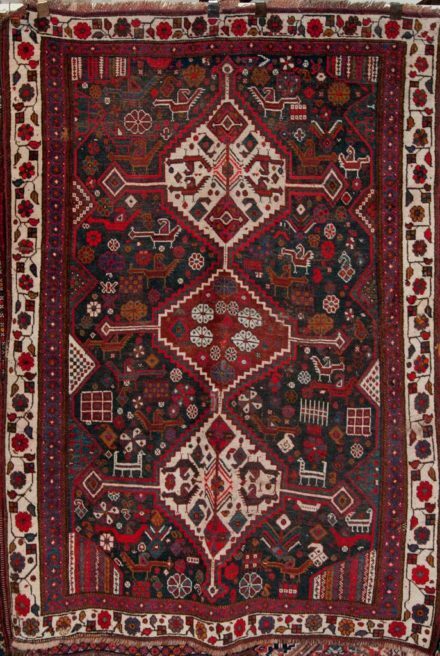 Qashqai rugs are named after the tribe in Persia who weave them. These rugs represent the talented weaving styles of the tribe. Combining unique details and texture with traditional family motifs, the rugs are heavily ornamented. They often feature geometric patterns and highly developed floral designs. The Qashqai rug colors incude red, saffron yellow and navy. 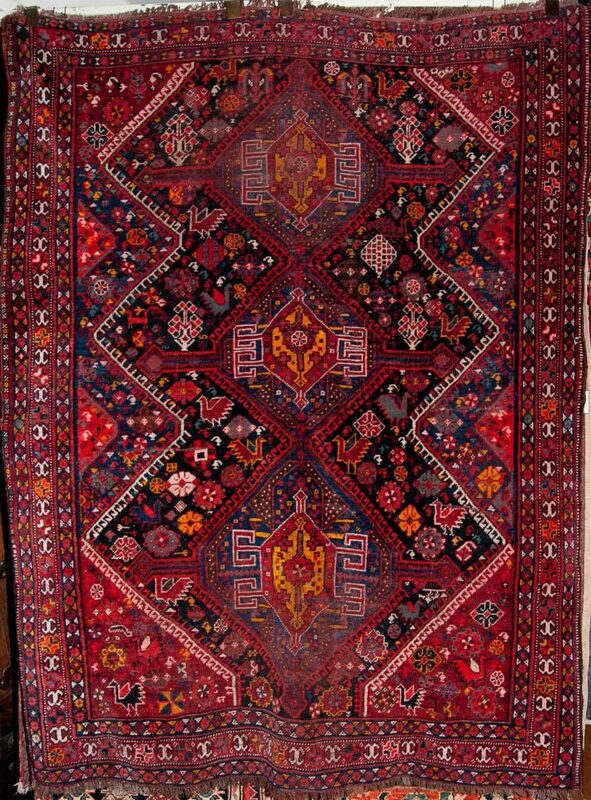 Qashqai rugs have several different types of medallion layouts and this is because of the different origins of the weavers who learn the different layouts from their families. The Qashqai rugs are woven by Qashgai tribe women, who came from different ethnic backgrounds including Turkoman, Arabs, Lurs and Kurds. Irrespective of their ethnic or cultural background, these weavers all descended from several generations of skilled weavers who passed their tradition down to their descendants. In some layouts, the medallions appear shaped as hexagons or regular diamonds. Sometimes they appear as 3 diamonds that are vertically connected. Another common patterns is to have 4 hooks surrounding a small sized diamond or square shaped feature inside the medallion. Sometimes, this square or diamond surrounded by hooks appears in the rug as an all-over pattern.